A recent episode of CBS's prime-time hit, The Big Bang Theory, featured a subtle homage to technology that can be traced to the University of New Brunswick. As the director of the University of New Brunswick’s Planetary and Space Science Centre, John Spray is among those who believe that the truth behind Mars’ mysterious and potentially life-supporting past will finally be unearthed as a result of NASA’s latest Curiosity rover mission. Spray and his fellow researchers at UNB – Beverley Elliott and Lucy Thompson - are part of the science team responsible for one of the NASA Curiosity rover’s key instruments: the Alpha Particle X-Ray Spectrometer (APXS). 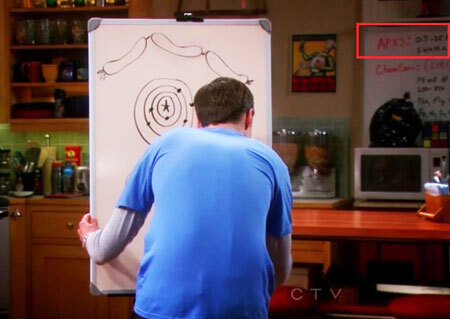 In a recent Big Bang Theory episode, a note about the APXS instrument is visible on a whiteboard behind series star Jim Parsons. In addition to working directly with the APXS Spectrometer, Spray, Elliott and Thompson will study the geology of the site where the rover landed: the 155 km-diameter Gale impact crater. Spray, Elliott and Thompson will examine the geology of the site to figure out how and when the crater was formed, as well as helping to identify the materials it now contains and the geological conditions the crater formed under.